The Backstage Theatre presents the stage adaptation of E.B. White’s “Charlotte’s Web,” running today through July 14 at the theater in Breckenridge. Christopher Willard, artistic director for the Backstage Theatre, directs the production. White’s award-winning children’s tale weaves the plotline for the play, a story of unexpected friendship between Wilbur the pig and Charlotte the spider. 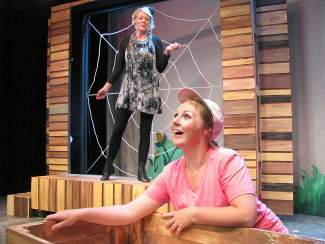 In an attempt to save Wilbur’s life, Charlotte spins words in her web, hoping to attract visitors to marvel at the pig. The spider’s plan unravels at the county fair, where Wilbur and Charlotte’s fate is made clear. Willard said it’s the story that makes the production special. For children and adults who are fond of the original book, Willard said the theatrical version mirrors it very closely. For more information and tickets, visit http://www.backstagetheatre.org.